Preamble: I posted my weight training routine from 1985-1992, followed by a lengthy discussion on how to calculate your 1 rep max (1RM) and weight percentages. Here’s another weight training program for discussion. This is a 15 – 30 week weight training program. Each phase is 5 weeks long. After 15 weeks, you adjust the weight after “determining” your max weight. If you were Stephen Francis (Coach of Asafa Powell) you would have a testing week on the 4th week. I don’t recommend testing for singles or 1RM. Doubles or Triples are much safer. Remember Asafa’s pec injury prior to Beijing 2008? Each phase can coincide with a particular phase in training. For example, our easy weeks always coincide with US Thanksgiving and Christmas holidays, exactly 4 weeks apart. In this example, the hard days has 3 sets at a heavy weight. The light days have 2 sets with a lighter weight. Round up to nearest 5 pound weight, using 2.5 pound weights. I prefer to swap the order of the Power Cleans, Squats, and Bench Press (PC, SQ, BP) followed by the ancillary exercise or even ditch the ancillary altogether. 4 exercises at 4 sets can take up to (and over!) an hour. The big rage in Meathead Weight Rooms are 5×5 routines for mass and strength. I like to start with large muscle groups and work my way down to smaller muscle groups. Somehow, the power cleans always zap the energy out of me. If I was performing a split routine, I would do a “2 plus 1” (2 major plus 1 ancillary), but that wouldn’t incorporate a light day. My personal recommendation for Track and Field athletes is 45 minutes maximum in the weight room. This is after spending 2 hours (or more) at the track! On the other hand, John Smith’s HSI group has 11am weight training followed by 1pm on the track. This has added benefits such as a warm up and CNS stimulation prior to the track workout. Regarding weight training for strength, as I competitive powerlifter, former weightlifter and club /high school speed/strength coach I can say with confidence that doubles and triples are not safer than singles. I cannot speak directly as to Asafa Powell’s pec injury but I would speculate that it had more to do with poor technique than with the weight. Most likely he was using a wide grip, did not have his shoulders pulled in and had his elbows out. This is typical of non-competitive powerlifters. Those who are class1 and above powerlifters know better. I just came back from high school lifting with sprinters and had the occasion to comment on this very issue. Frankly wide grip barbell benching for sprinters is less effective than close grip or dumbbell work as the wige grip emphasizes pec work rather than shoulder and tricep work which would be better for a sprinter and is much safer. 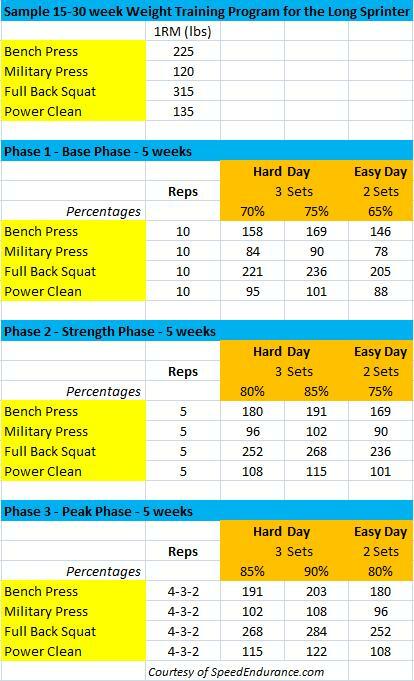 If anyone is inclined I would be happy to provide a template for maximum effort and speed effort workouts for maximal absolute strength and starting strength. I use scientifically developed powerlifting protocols. I have excellent results and have no issues with injuries. A couple specific suggestions off the top would be to drop the cleans and substitute a variety of box squats, deadlifts and reverse hypers for the standard squats and pulls. It would take considerable space to explain the reasoning but these are far superior exercises for these uses. Cleans require considerable technique to perform properly, are rarely performed decently by non-weightlifters, are subject to injuries, and are not as directly related functionally to sprinting as are other easy to learn and safer exercises. Ask any competitive weightlifter how many years it takes to develop solid technique. And, please stop mixing upper body and lower body workouts. Sprinters are not bodybuilders they are strength athletes. The basics are that development maximal absolute strength requires efforts at 90% and above. Development of starting strength requires movement from a dead stop without elastic rebound and requires continuous acceleration and thus a weight usually in the 40-60% of maximum range depending on strength relativities. Because some athletes can accelerate as well for a second and on occasion for a third rep speed lifting should be practiced with doubles and for a few athletes triples with lighter weights and accommodating resistance. Using Prilipen’s studies the base rule would be 8-12 sets of doubles. The routines I put my athletes through run 40-45 minutes on a max effort day and 20-30 minutes on a speed/acceleration day. Both of these type workouts are done year round with no negative effects on technique. Pat, could you email me a copy of the template for maximum effort and speed effort workouts for maximal absolute strength and starting strength that you referred to. I assume that you are using Westside as the template? I can see your argument for using deadlifts and reverse hypers etc instead of the so called power lifts but is there any purpose “speed” benching when you are not seeking to deveop the technical ability to bench press fast or indeed any need to have a max bench day at all ? Yes there is a specific reason for speed workouts with weights; mainly two. First is starting strength. This is not particulalry important for sprinters as to pressing but it is very important as to box squats and starting out of the blocks. taking a weight and keeping the stabilizing muscles firing but relaxing the hip flexors on the bench/box then going into a full out explosive squat trains the ability to react quiockly with maximal force. For youth sprinters, baseballers, and soccer players I train this has helped significantly for the first 3-4 steps but particularly the first two. Speed work for pressing is not directly relevant to sprinters but might help with the start slightly. This definitely heps with throwers. My position usually comes down to sport specific coaches applying bodybuilder type workouts and periodized programs which go from one phase to another to their athletes with intent to improve strength, power or speed. The general result is a little of these with considerable weight gain. Definitely a negative from a speed point of view. If one utilizes roating maximal strength exercises and speed strength exercises absolute strength, speed strength, power and strength speed can all be continuously trained throughout the year with minimal weight gain and only moderate impact on revocery ability. Typical muti set high rep routines create a large impact on revery with minimal gains, except in increased body weight. Separated periodized programs (only used in the US) improve recovey impact but work single aspects of strength at the expense of others. Clearly this is not maximally efficient. Finally, a couple big issues with me (former weightlifter and powerlifter) is the use of cleans. while good exercises if you plan to be a weightlifter they are technical lifts and few if any non-lifter athletes ever learn enough skill to use them with maximal weights. Additionally, being complex movements they lend themselves to a need for direct coaching and higher than necessary incidence of injury. I love weightlifting but it is a sport into itself and there are other simpler and more efficient methods to improve strength components for non-lifter athletes. The second item is the misstatements made bycoaches relative to strength exercise performance. In example, a promanent coach claimed a great powerlifter developed great deadlift strength by doing deadlifts and so only deadlifts should be used for leg strength. Well, the powerlifter in question clearly is one of the greatest of all time but she used variations of box squats extensively to develop her deadlift ability. Oh and by the way, she follows a Westside program and competes for Westside. In my opinion she is the top female powerlifter of all time and is likely extremely fast for 20 meters. Of course I have never seen Amy run. She uses maximal effort and speed strength workouts in her protocols. I am a big proponent of deadlifts but the coach apparently did not know the background of the lifter to whom he referred. It reminds me of football tryouts where the number of 225 bench reps one does is considered important. All other things being equal I would prefer the play with the highest weight for a single. He can do the reps anytime and his first heavy hit on his opponent will be harder. I forgot to say that Westside protocols ar not a template. They espouse several methods combined in a system adjusted to the particular goal and athlete in mind. I agree with the methods used by Westside as they are logical, scientifically based and tested on elite powerlifters not the general non-athlete student body at the local college. I have a few of my own protocols I use because I train youth ahtletes not generally associated with powerlifting and their interests are different than those of competetive lifters. i will put up a program I just set up for 15 year old male soccer players. Of the 14, including the keeper, 4 particpate in track. three sprinters and a jumper. The sprinters in their first track season as freshman ran 11.3., 11.5, and 11.8 in the 100m. They all made 19 plus long jumps with no practice. The jumper went 39.6 in the triple jump. Two of them ran varsity as freshmen. They have two weeks soccer practice under their belts and will start lifting June 23rd. As a measure, three of them lifted with me just before the past high school track season started. Six leg workouts and six upper body. Their group with three others averaged 115 lbs on the first squat work out and 85 on their bench ( we did not do much bench). After six weeks they averaged 225 for the squat with 2 going 245 and 245 deadlifts and 135 on the bench. Granted they are novices so improvement comes very quickly but with a solid sprint coach they went from mid 12s to mid 11s in the 100m. I think the lifting helped. OK setting up for speed / strength work for 15 yr old male class 1 soccer players. This give an example of weight based strength training I use for team sport athletes. These athletes are all class 1 soccer players and are in very good general condition. They will have skills & tactics soccer training in the evenings Tuesdays & Thursdays and skills & conditioning soccer practice Wednesday evenings. They will also have soccer matches both Saturday & Sunday every other weekend. we are going on 10 weeks of strength training to include absolute strength, speed strength & a little strength endurance. After the 10 week period the athletes will resume school and we will have only the max effort leg day (Mondays). We will run lots of short sprints on Wednesdays. Most of these players are honors students and their homework load during school is more than I had in college. (if athlete can continue with excellent form we keep going up on singles until form gets loose.. this is usually 90-95% of a mx effort. Since these athletes are not training to be lifters we do not go to failure ever.). weights given are based on expectation for 5’8″ 150lb soccer players. I have a couple squatting 300 and they sprint as well. Variety of standing abdominal work then range of motion movements and we are done. About 45 minutes working ina group. Tuesday – Heavy Effort Upper Body. Variety of abs lying and standing. Range of motion movements and we are done. About 35 minutes. Buffalo Bar Speed Box Squat (40-60% max weight plus minim jump stretch bands for doubles or traiples with explosive start and short rest periods. Testing Speed of lift 165 + mini x 1, 185+ mini x 1. check for slowing. 2 sets of moderate weight 10-15 reps. we want to build hamstrings to protect knees. Variety of ab work mostly standing. Range of motion and done. About 40 minutes. Friday – Speed & General Strength Upper Body – May be skipped depending on next day matches. Notes: every two weeks we change base exercise for legs: buffalo bar box squat, gerard bar deadlift, safty squat bar, barbell, or dumbbell deadlift, barbell Box Squat. For upper body we alternate base exercise from Dumbell Push Press, Dumbbell Bench Press, Barbell Push Press, Barbell Bench Press or hanging strap push ups or all jump stretch band front presses.. Some of these athletes are in other sports so we correlate the pressing movements to their sports. No barbell pressing for throwers we use dumbbells or closed kinetic chain movements for them. We also do sprinter type skipping and stride exercises aas warm ups on soccer training days and as main exercises on soccer conditioning days. when we get back to school we will alternate the heavy leg lifting day with a sled pushing/pulling day. We use a lot of sled pushing for players who need to improve starting speed. I hope this is useful. 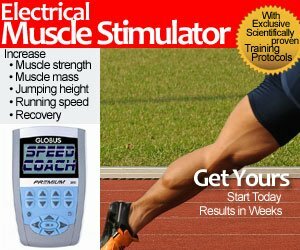 We have had great success with powerlifting style weight training, sprinter style skipping & stride technique work and specialty sled work for many years. Our soccer & baseball players are regulalry the fastest we see and several turn into track athletes as well. @Pat – Thank you for the detailed training plan! Nice post! This is a very interesting workout routine. To find out more on weight lifting programs, you may also want to consider visiting this site.